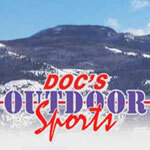 “Your prescription for outdoor fun!” We can fix you up for fishing, camping, hunting or hiking. Full line of t-shirts and ski clothing. Get your rentals for skiing, snowboarding, snowshoes and cross country skis. Largest inventory on this side of the mountain. Make reservations online. We Sell hunting & Fishing License. Also we sell fresh fudge, cappuccino,gift items , clothing, outdoor clothing,rain gear,boats, rafts and all kind of fishing & hunting equipment.